Opposite: Frances Glessner Lee working on one of her 19 Nutshells. They were built at one inch to a foot (a standard dollhouse scale) with fastidious craftsmanship, achieved with dental tools and a carpenter’s help. To a forensic investigator, trivial details can reveal transgressive acts. Consider the card Frances Glessner Lee carried in her later years, listing both her married name and her honorary title—captain of the New Hampshire State Police. A hybrid of the calling card ubiquitous in the genteel society into which she was born, and the business card of the forensic visionary she became, that artifact is material evidence of her unusual life. Conducted within the contours of conventionality, Glessner Lee’s activities were consonant with the one career she was expected to assume, that of society matron. Her tables were elegantly appointed, her fortune endowed a worthy cause, and her leisure time was productively devoted to a hobby many women enjoyed: making miniature scenes. That her dinner guests dissected grisly details of crime scenes over their consommé, or that within her dollhouse dioramas, cheery dotted-swiss curtains and floral wallpapers belied the presence of dead bodies, indicates not merely quirky details of a wealthy eccentric’s golden years, but also substantiates the checkered career paths many women took, or invented, during the first part of the twentieth century. “Fanny” was a sheltered and indulged child, raised in a household that epitomized the aesthetic and moral ideals of nineteenth-century domesticity. Her mother, Frances M. Glessner, oversaw the family’s well-being and cultural causes, a model helpmeet to her father, industrialist John Jacob Glessner, who made his fortune building International Harvester. In 1886, the Glessners broke ground for a stolid domestic fortress designed by H.H. Richardson, the era’s foremost American architect, on Chicago’s fashionable Prairie Avenue. The massive granite exterior only accentuated the rarified interiors within. A series of unfolding spatial tableaux framed art objects, fine furniture, and views of the Glessners’ family life gleaned by friends, acquaintances, and servants. Architecturally, the house embodied a cherished conceptual divide of the period: between the distinctly masculine public realm and the private, feminine, interior. Glessner Lee could now follow that urge. Her close friendship with her brother’s classmate, George Burgess Magrath, A.B. 1894, M.D. ’98, later a professor in pathology at Harvard Medical School and chief medical examiner of Suffolk County, had ignited her interest in the nascent field of forensic investigation. Using her fortune and visual talents, she entered that world while perpetuating the feminine roles she had rehearsed in her married life. In 1931, she endowed a department of legal medicine at Harvard. Subsequent gifts established the George Burgess Magrath Library, a chair in legal medicine, and the Harvard Seminars in Homicide Investigation. She presided over the seminars in grand fashion, the only woman among 30 or 40 men, giving banquets at the Ritz Carleton for the participating detectives and medical examiners, personally overseeing elaborate menus, floral arrangements, table settings. But it was through crafting dystopian dollhouses that Glessner Lee achieved her special prominence. Convinced by criminological theory that crimes could be solved by scientific analysis of visual and material evidence, in the 1930s and ’40s she constructed a series of dioramas, the Nutshell Studies of Unexplained Death. Did a corpse mean murder, suicide, death by natural cause, or accident? If only the setting could be seen properly, the truth, “in a nutshell,” would be exposed. The wealth of material evidence at a crime scene is overwhelming, but—guided by a geometric search pattern (Glessner Lee suggested a clockwise spiral)—methodically precise vision could be acquired. Donated to Harvard in 1945 for use in her seminars, the dioramas went in 1966, when the department of legal medicine was dissolved, to the Maryland Medical Examiner’s Office; they are still used for forensic seminars. Although the crimes depicted in the Nutshells were composites of actual cases, the character and decoration of the dioramas’ interiors were Glessner Lee’s invention. Many display a tawdry, middle-class décor, or show the marginal spaces society’s disenfranchised might inhabit—seedy rooms, boarding houses—far from the surroundings of her own childhood. She disclosed the dark side of domesticity and its potentially deleterious effects: many victims were women “led astray” from the cocoon-like security of the home—by men, misfortune, or their own unchecked desires. Morgues and crime scenes were hardly places for ladies of good breeding to discuss, let alone visit. Glessner Lee’s Nutshells allowed her to obtain professional recognition and transgress limitations imposed by spatial and gender stereotypes. Refusing to confine her identity and intellect to the comforts of domestic life, she nevertheless recreated, in miniature, variants of the very spaces she sought to transcend. In so doing, Glessner Lee created her own liminal place, located between the proprietary spheres of public and private, and masculine and feminine, as categories were defined—and challenged—in her lifetime. 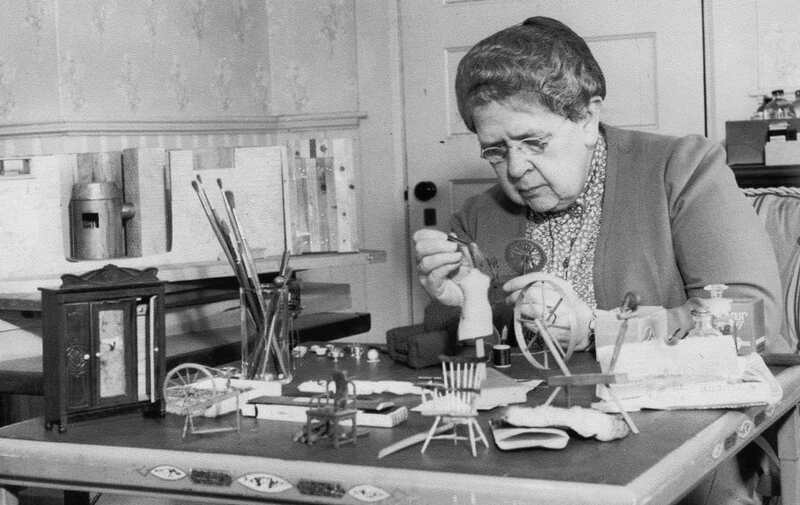 [Image] Frances Glessner Lee working on one of her 19 Nutshells. They were built at one inch to a foot (a standard dollhouse scale) with fastidious craftsmanship, achieved with dental tools and a carpenter’s help. Obsessive about the amount of evidence required to sharpen visual perception, she wrote to an adviser at Harvard Medical School, “I found myself constantly tempted to add more clues and details…stop me when I go too far.” Her quest for verisimilitude led her to include operable windows that would never be opened; to wear an out-of-date suit to obtain properly worn material for miniature trousers; and to whittle tiny clothespins to hang stockings that she knitted on straight pins. [Images] In “Kitchen,” the calendar beside the window runs through December, although the incident depicted took place in April. In “Three-Room Dwelling” and “Attic” (above), material clues—the pattern of spattered blood and the rope’s position—are as precisely rendered as the placement of the deceased. Laura J. Miller is an associate professor of architecture at the Graduate School of Design. Her essay "Denatured Domesticity: An account of femininity and physiognomy in the interiors of Frances Glessner Lee" has just appeared in Negotiating Domesticity (Routledge).